Warning: Spoilers for this week's episode of The Walking Dead TV show and the comic books. This week's installment of The Walking Dead featured a subtle Easter egg that could potentially spell bad news for one troubled character. Towards the end of the episode, Rick's bravado somehow managed to convince Jadis to align her Scavengers with the Alexandria, Hilltop and Kingdom alliance. Their newly re-forged friendship soon hit a snag, however, as Rick climbed atop a water tower near the Sanctuary and discovered that the horde of zombies he had dumped on Negan's doorstep in the season 8 premiere had been completely cleared. As should be expected by now, Rick had to deal with some stray walkers before he could ascend the tower and it was in this sequence that the Easter egg was dropped. It appeared that one of Rick's snipers surrounding the Sanctuary had got their foot trapped in the ladder and was left dangling upside-down near the bottom of the tower, helpless as the nearby zombies snacked on his temptingly available torso. Interestingly, this is exactly how Gabriel dies in The Walking Dead comic series. Although the print iteration of the Priest is killed during the battle against the Whisperers rather than Saviors, he too loses his footing while on sniper duty and is eaten alive by a pack of the dead, albeit only after a swift stabbing from the Whisperers' second-in-command. And although it may be a mere coincidence, the unnamed sniper from this week's episode is also sporting a black shirt that looks somewhat similar to Gabriel's signature religious getup. The Walking Dead season 8 has featured a range of comic Easter eggs thus far and as such, this scene could simply be nothing more than a nod to the show's source material for those viewers who are familiar with it. However, given Gabriel's current predicament, it could also be foreshadowing the character's near future. The poor Father has had a torrid time of late. His heroic attempt to rescue Gregory was repaid with betrayal, leading to Gabriel having a close encounter with arch-nemesis, Negan. Having escaped that nightmare using the ol' cover-yourself-in-zombie-guts trick, Gabe quickly came down with a nasty infection - despite virtually every other character to have used the technique coming out unscathed. Not only is Gabriel slowly dying, he's also currently a prisoner of the Saviors and can't even count on his old buddy Eugene for help. 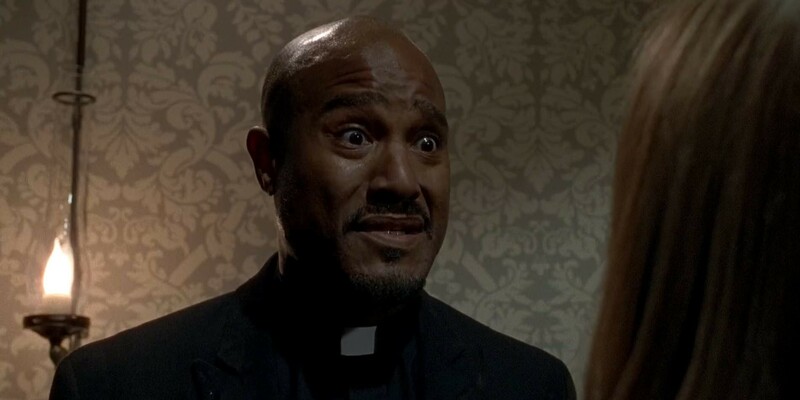 With things looking decidedly bleak for Gabriel, was this Easter egg The Walking Dead's way of quietly hinting that the TV version of the character will soon be as dead as his comic book counterpart? Alternatively, comic-Gabe only fell from his sniping post after witnessing the oncoming threat of the Whisperers and rushing down in an attempt to warn his friends. Could the TV adaptation's unnamed sniper have spied something similar occurring with the Saviors? The Walking Dead continues December 10th with "How It's Got To Be" on AMC.